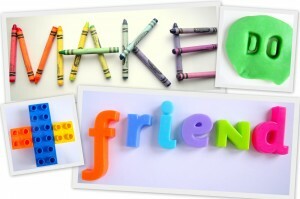 The ABCs of Make Do & Friend … and this week’s Kids Co-Op Linky! Age 25 – I always say ‘twentysomething’ when I’m out and about though, I think people assume I’m older, either that or motherhood has just aged me! Bed (size) I don’t know this one! We co-sleep so it’s more like 35% Daddy, 60% Vinnie and 5% teeny tiny corner with no blanket for me! Chore you Hate Washing up. It’s the absolute worst thing ever! Dogs? I don’t mind them, but what I don’t like is ‘dog people’ – when they compare having a puppy to having a kid, that gets on my nerves! Instrument I used to play drums back in my teenage years. I wanted to start a Riot Grrl revival. Now I’d settle for a nice piano! Time it takes to get ready Minutes. Eyeliner, lipgloss, scrunch of the hair and a pout! Underwear Not very flattering these days!